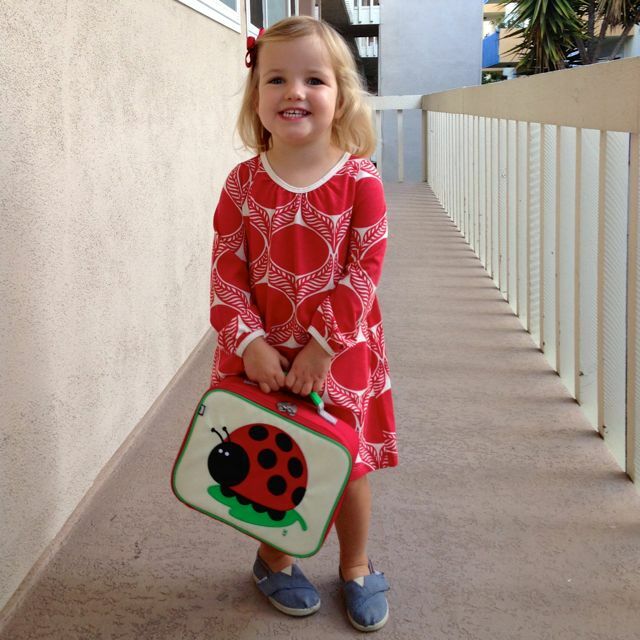 I’ll admit: I was not looking forward to lunch-packing when Lucy started preschool in September. But I’ve actually had so much fun with it! And it’s much easier than I anticipated – partly because we usually have kid-friendly leftovers at home and partly because Lucy is loving little bowls of finger foods. Here are a few of the lunches she’s enjoyed in recent weeks. 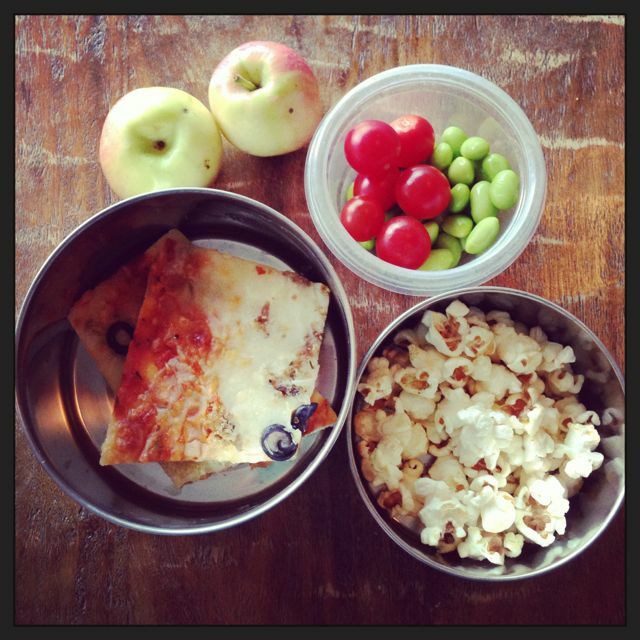 Veggie pizza, edamame, grape tomatoes, mini apples and kettle corn. 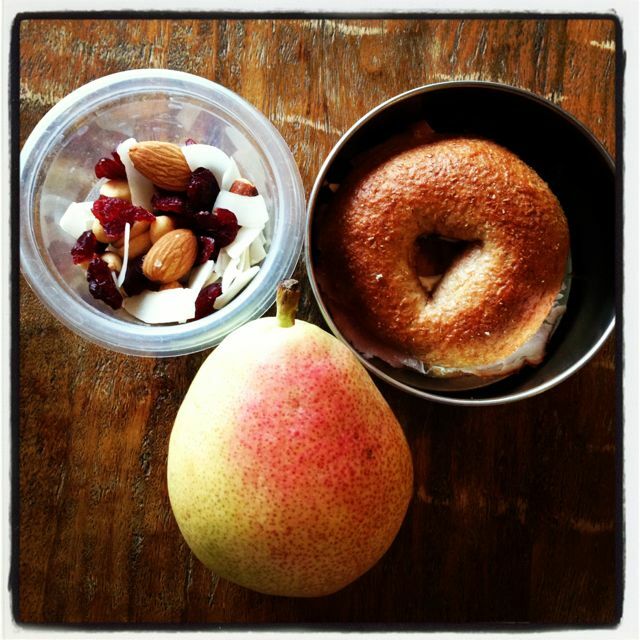 Mini whole wheat bagel with cream cheese & ham, fresh pear, and homemade trail mix. 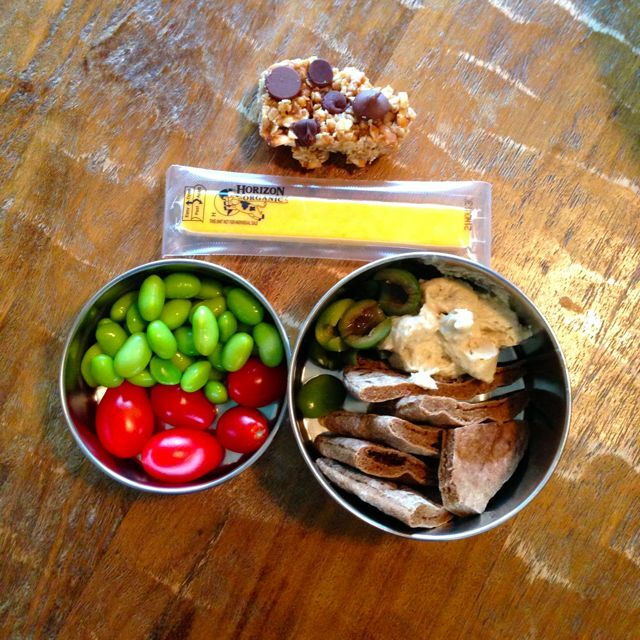 Whole wheat pita with hummus & olives, tomatoes, edamame, cheese stick and homemade granola bar. 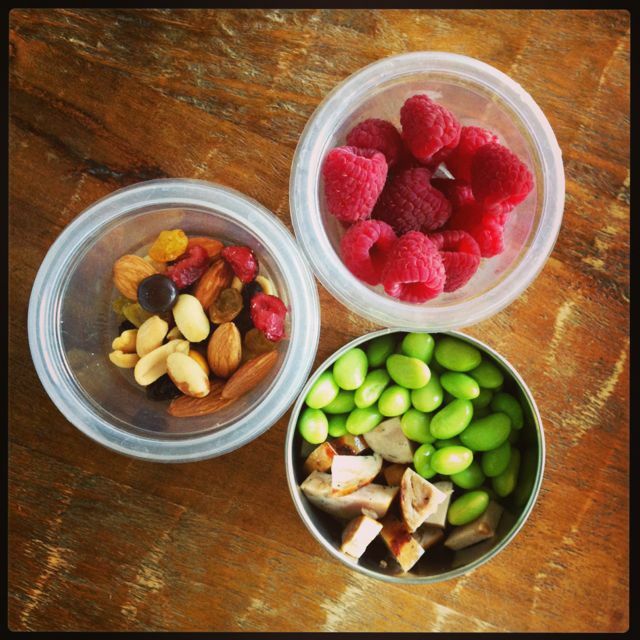 Applegate chicken-apple sausage, edamame, raspberries, homemade trail mix. 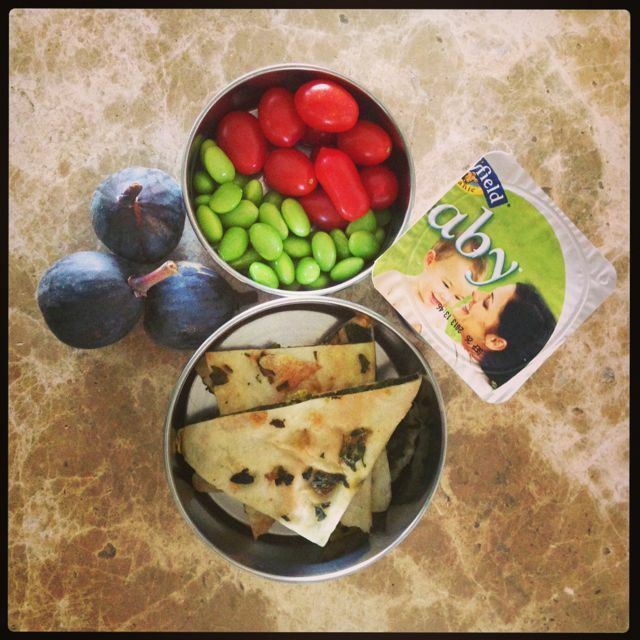 Spinach bolani (Afghan spinach pancake I buy at the farmer’s market), tomatoes, edamame, Stonyfield yogurt and figs. 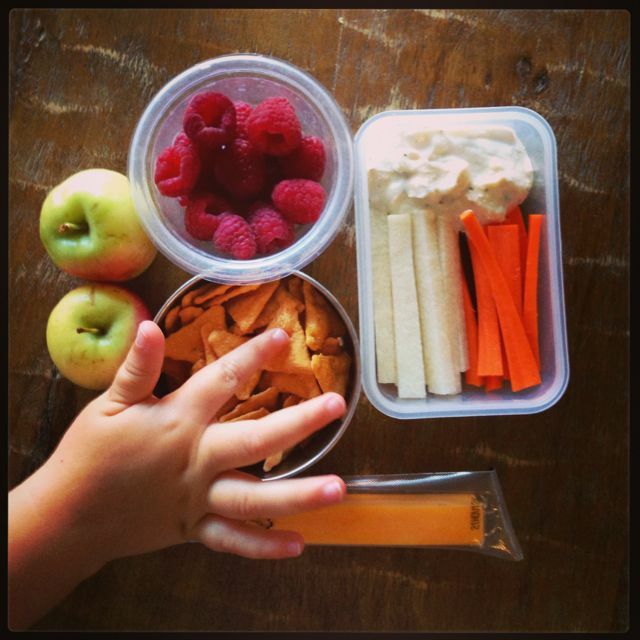 Carrots & jicama with yogurt dip, Crunchmaster cheese crackers, organic cheese stick, raspberries and mini apples. 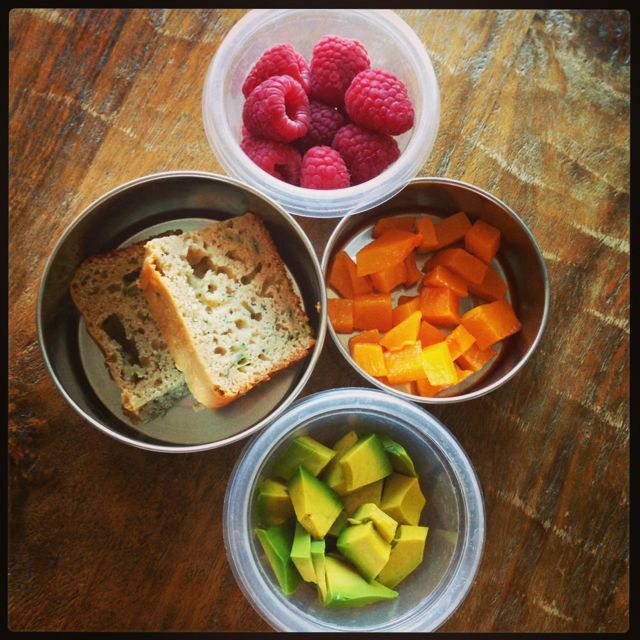 Zucchini bread, butternut squash cubes, avocado and raspberries. Baguette slices with butter, roasted Parisian carrots, apple slices and grapes. 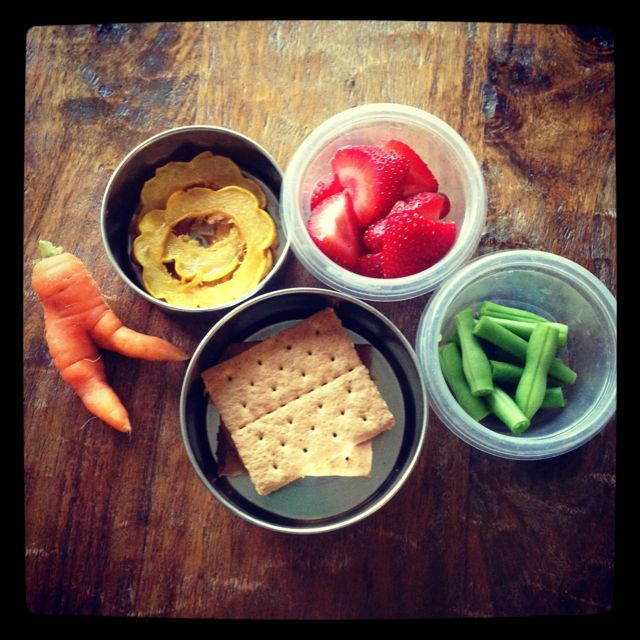 Graham crackers with peanut butter, delicata squash rings, strawberries, green beans and a carrot (harvested by Lucy!). 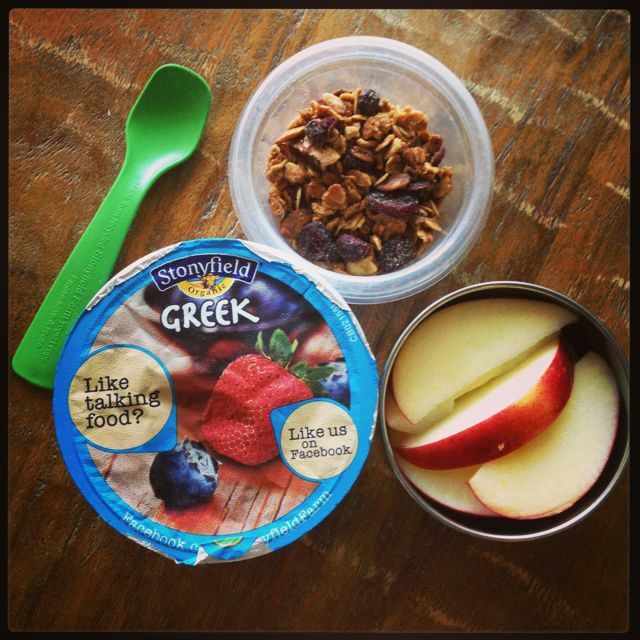 Plain Greek yogurt, Earthbound Farm cranberry pecan granola and apple slices. Follow me on Instagram for more ideas! You’re such an amazing mother! 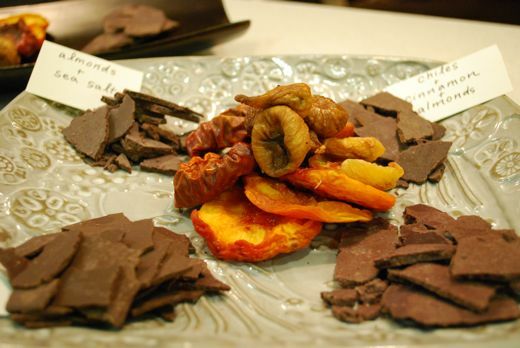 I love the effort you put into providing Lucy with balanced meals, and I think the “tasting plate” style works great for kids – I always do a small portion of several things when I’m cooking for my nieces and nephew! I love these ideas! My oldest son’s daycare provides great meals for the kids, but I’m already thinking about packing his lunches when he starts kindergarten. I like the idea of lots of choices and easy to eat finger foods. So great when daycare does the work – especially when they do a good job. Moms deserve that! 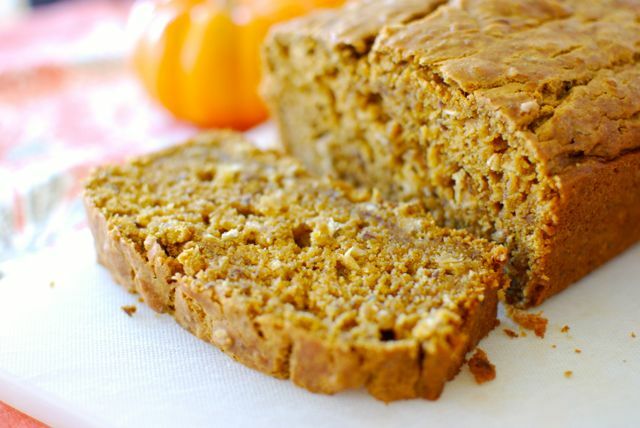 Eating Made Easy is such a great website! 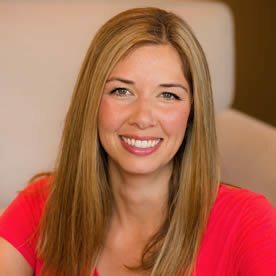 I love looking at all your tips and ideas. Thank you. Taylor and Zoe have been asking for the exact same lunch everyday (mostly Tay), which I know is boring and doesn’t leave much room for healthy variety or the adventure of trying new things. So, I went to your site and found your 10 easy lunch ideas, brilliant!!! I can’t wait to put them into action. I have one question though. Both my kids turn up their noses when the food in their lunch turns brown from the time I pack it to when they have lunch time. You know, like apple slices, pears, avocados. Any good tips for keeping it looking fresh for my picky eaters? I toss avocado chunks with lime juice before putting them in Lucy’s lunch. For apples, I squeeze some fresh orange juice on them before packing up. 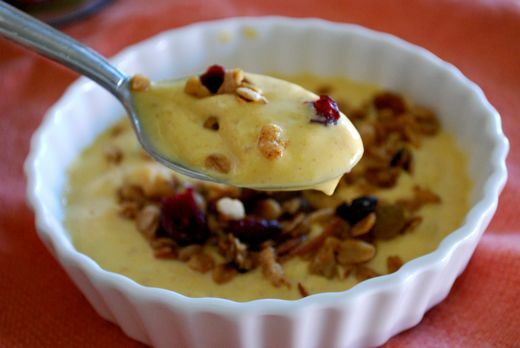 If your kids don’t mind citrus taste, these are fool-proof methods. Pears are tougher – I usually either give her pears whole or serve them at home! 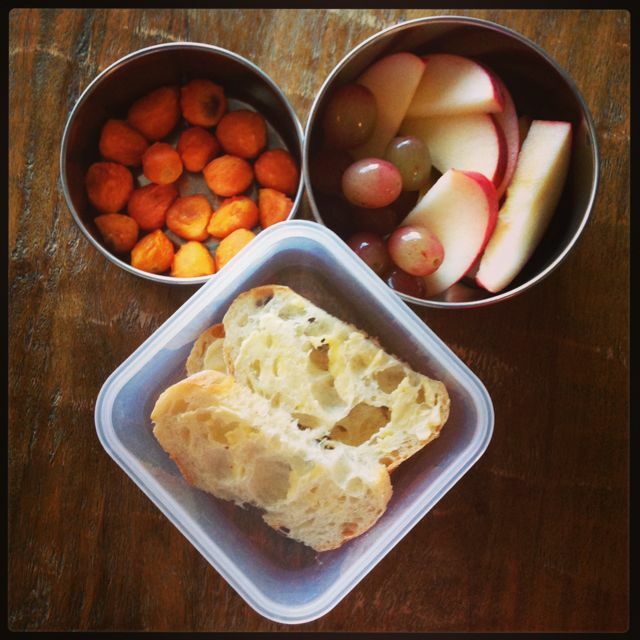 Man oh man, to come up with these amazing lunches- you totally rock as a Mom! I am pinning these for my daughter to make for her daughter. OK, my granddaughter is only 2 months old right now, but that is the beauty of Pintrest, you can pin it and save it for later! 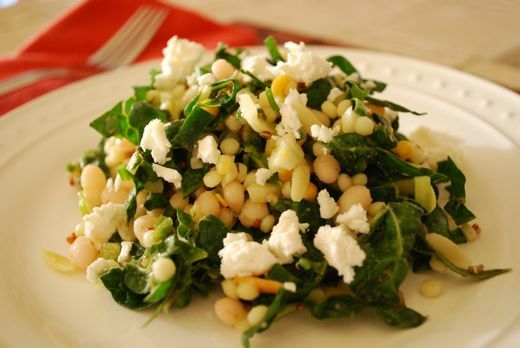 Thank you for your awesome, healthy lunches!